Home Dairy ROSES FOR YOUR VALENTINE? The perfect finale for a romantic dinner with that special someone! Recipe adapted from Nourished; a Cookbook for Health, Weight Loss, and Metabolic Balance. One of the most memorable desserts I ever had was a tiny scoop of rose-flavored ice cream nestled in the heart of a perfect, pale pink rose. It was presented simply, with no cookie or cake to steal the limelight. There were hundreds of guests at the event, and yet every petal was perfect and the ice cream was seemingly suspended in that fleeting, meltingly-spoonable-but-still firm stage. To pull off such an ambitious feat was a staggering achievement for the restaurant staff. I don’t remember exactly where or when it happened, but I’ll never forget the night we ate roses. Prepare a large bowl of ice water for cooling the pan after cooking the custard. Whisk the bulk sweetener, erythritol, pectin, salt, and any dry sweetener, if using, together in a medium bowl. Break up lumps and mix dry ingredients thoroughly. In a medium bowl, beat the egg yolks with a whisk until smooth. Whisk in any liquid sweetener and the half and half. Sprinkle dry mixture over egg-yolk mixture and whisk until well blended. Heat one-half inch of water in the bottom of a double boiler to a simmer. Put the custard mixture in the top pan and place over, but not touching, the hot water. Cook, stirring constantly with a heat-resistant spatula, until slightly thickened and an instant-read thermometer reads 175º to 180º F. This may take about 8 to 12 minutes. Scrape the sides of the pan often with the spatula and scrape off the custard that sticks to the spatula itself with a knife or a second spatula while cooking, to prevent any lumps from forming. (If you do get lumps, remove the custard from the heat and whisk vigorously until smooth.) Remove pan from the heat and stir in vanilla. rose extract, and color, if using. Strain the custard into a bowl and place the bowl in the ice bath to cool it quickly. Continue to stir until cold. Cover and chill the custard thoroughly (8 hours or overnight) in the refrigerator. Whip the egg whites until foamy and add cream of tartar (if not using a copper bowl). Continue to whip until stiff but not dry. In a second bowl, with the same beaters, whip the 3 cups of cream until thick but not stiff, being careful not to over beat (or it will make butter). Stir the custard mixture, pressing out any lumps that may have formed and gently fold the cream and egg whites into the custard. Churn according to the directions for your ice cream maker. (It takes about 25 minutes with my Kitchen Aid Mixer attachment.) Scrape ice cream into a shallow container and cover with a piece of parchment paper laid directly on top of the ice cream. Cover container tightly with a lid or foil and place in freezer for 2 to 3 hours to ripen before serving. If frozen for longer, let soften in refrigerator until scoop-able. All homemade ice cream that has been stored in the freezer for more than a few hours needs to soften in the refrigerator before serving. The length of time depends on how solidly it is frozen and the thickness of the layer of ice cream in the container. One recipe of French Vanilla Ice Cream, frozen in a 2-inch layer, may soften in as little as 10 minutes. If the layer is thicker, it may take up to 30 minutes or more. Set a timer and check it every 10 minutes until you learn how long it takes. Freezing the ice cream in several smaller containers will make it faster to bring one portion up to serving temperature and will prolong the storage life of the rest of the batch, which will not then be subjected to repeated softening and refreezing. Makes about 2 quarts or 16 servings of ½ cup. Preparation time: 1 hour active; 11 hours total, including chilling and freezing time. amount overflows the bowl, so for the Kitchen Aid and the small counter-top models, like Cuisinart (which hold 1 quart), cut the recipe in half. Pasteurized egg whites do not work well for beating, however because the whites will not attain enough volume. Dried egg whites, such as Just Whites, can be used instead of raw egg whites in recipes that will not be cooked. To use Just Whites, mix 2 tablespoons with 6 tablespoons water. Stir gently for 2 minutes then continue to stir until dissolved (a tiny whisk works well for this, the kind intended for use as a bar tool). Oligofructose and polydextrose are similar sweet fibers. Oligofructose is indigestible fructose; polydextrose is indigestible glucose. The biggest difference is in price. Oligofructose-based sweeteners cost about 10 times as much as polydextrose (it is made out of corn, however, which some people prefer to avoid). Disclaimer: I will receive a commission from the sales of the book above. Ice Cream, Rose Flavor. Bookmark. What is the purpose of the pectin? A stabilizer / emulsifier? And how well do you want to mix the whipped cream and whites into the custard when folding? ( I assume the cream first, then the whites) I've only ever made a custard base for ice cream by heating blended yolks & all milks. Hi Emma. Thanks for the comment! 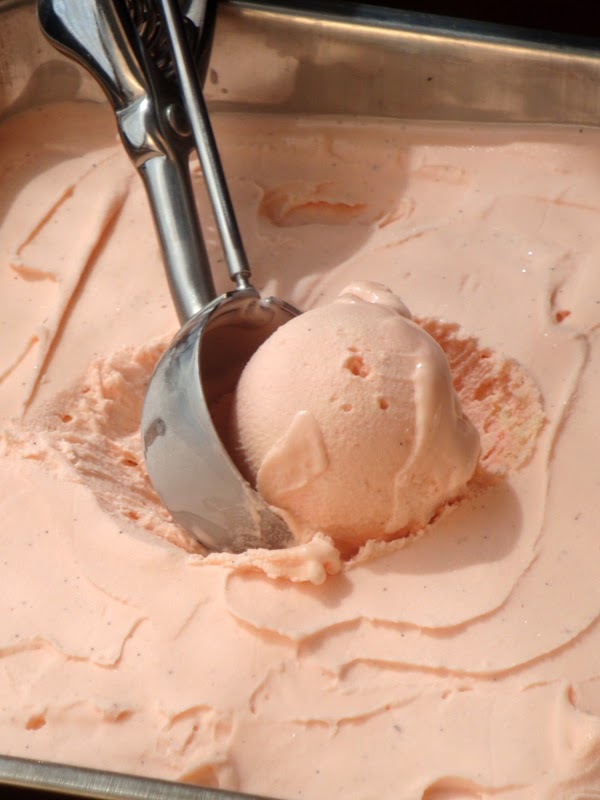 The pectin helps keep the ice cream from freezing too hard and makes it hold its shape a bit longer before melting. Just blend the beaten whites and cream in until there are no big streaks. Churning should blend it more as it freezes. I recently dug out my ice cream maker for the firs time in years, and have been experimenting with low-carb ice cream/custards! I am going to try this as a vanilla ice cream to see how different the texture comes out from taking the time to whip & include the whites. I'm going to make your delicious biscuits again soon, too! Emma: My worst experience with strawberry ice cream was years ago. I just chopped fresh berries and stirred them in. They were hard as rocks! You have to crush them or pre-cook them before adding them. Glycerin or gelatin should work fine in the recipe, although gelatin can change the texture if you use too much. Enjoy! I have flower waters, including rose water, original middle eastern products and quite strong. Is this the same as your rose extract? Can you name our brand? To Unknown: Mine is Al Wadi brand. I don't know if they are all the same or not.